Teething... it's a daunting word isn't it. Before very recently I had no idea about what products were available to help with the 'teething process' or even what to do with them! Here are a list of my top teething essentials... they have made this experience a little easier for Maci and I so I hope that these items can help you too. 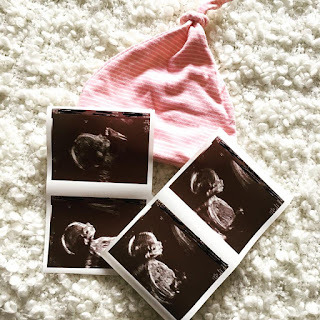 When I first asked on my instagram about what everyone suggested for teething products I had so many replies suggesting these and I must admit I was very sceptical. Although coming from a Beauty Therapy & Holistic background I knew the powers of natural crystals so I figured I would give it a go and I wasn't disappointed. Maci wears this 24/7 even when she isn't showing signs of teething but I personally believe this made a difference. Sophie is an 100% rubber teething toy. The giraffe shape means that even babies as small as 3 months can hold onto her legs and neck. Sophie also squeaks providing an entertainment aspect to keep the baby entertained. These toys can also be sterilized. Calpol can be taken from 2 months old (or the appropriate weight) and babies can take up to 2.5ml every 4 hours. 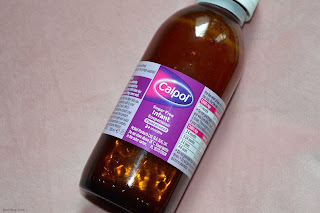 Calpol works perfectly alongside all the other products on this list, I kept the calpol for when Maci was being very grumpy and then I would give it to her in her bottle. I only discovered these a few weeks ago and they aren't the most effective things although I feel like they provide some comfort and relief. These Bush-baby teething wipes slide onto your finger (almost like a finger toothbrush) and then you peel off one side to expose a camomile paste which you then rub onto your babies gums. These can be used from 0-16 months. This product is INCREDIBLE! Dentinox is well known for its great products but this one tops the charts for me. You simply pop a small amount onto your finger and rub it into your babies gums to allow instant comfort. You can repeat this step every 20 minutes if needed. 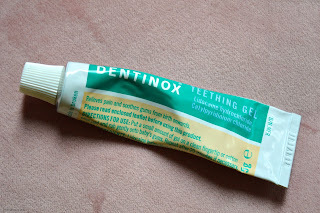 Dentinox Teething Gel contains active ingredients lidocaine and cetylpyridinium. 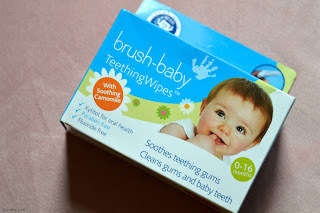 So those are my top teething essentials, I hope if you're struggling with a teething baby or toddler these products help you. If you have a favourite teething product that I have not mentioned please share it in the comments!